Verified identity decentralized with blockchain technology. 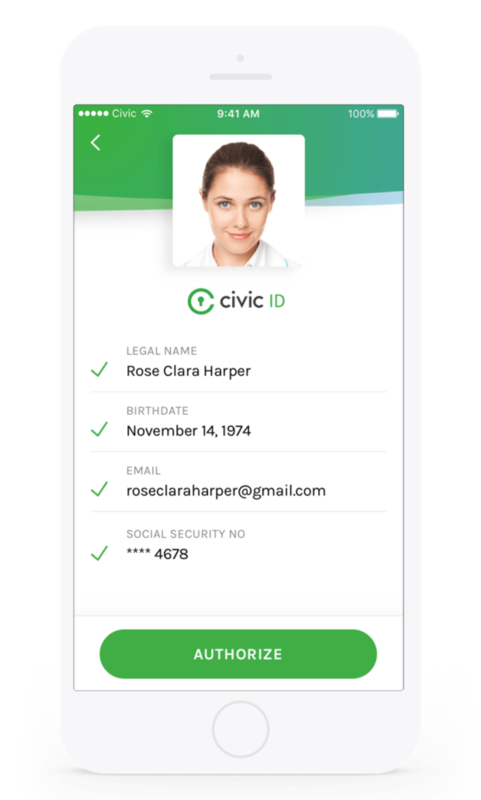 Civic’s Secure Identity Platform (SIP) uses a verified identity for multi-factor authentication on web and mobile apps without the need for usernames or passwords. With identity theft and data breach numbers reaching new heights every year, businesses pay millions of dollars to ensure that the transactions on their servers are authentic. Authenticate without the need for traditional physical IDs, knowledge-based authentication, username/password, and two-factor hardware tokens. New account creation can be simplified by providing verified identity data with the Civic app. While this service may sound similar to Facebook Login, Civic’s Secure Private Sign-up (SPS) and Secure Private Login (SPL) offers both privacy of data transactions and greater trust in user identity. With SPS, new accounts are created by the true owner of the identity data. Civic’s SPL enables you to allow your users to log in to your web and mobile apps without a username or password. SPL provides a better user experience and multi-factor authentication without weak passwords, password reset vulnerabilities, or the hassle of legacy two-factor authentication. Civic uses the public blockchain. This means that Identity Requesters do not have to invest a large amount of money to set up the technology infrastructure to support the Civic Secure Identity Platform solution. Identity data is revocable by the authenticating authority. For example, if a user changes their last name, then the former/invalid last name data is revoked on the blockchain by the authenticating authority. Identity data is encrypted and stored in the Civic App on User mobile devices. With third-party authenticated identity data, Civic cannot be compelled by a foreign government or criminal organization to invalidate identity data. Users store and share their own identity anywhere in the world. Their data is accessible anywhere in the US, Europe, Africa, or Asia. Civic uses the power of the blockchain to ensure the highest quality privacy and security for your business.